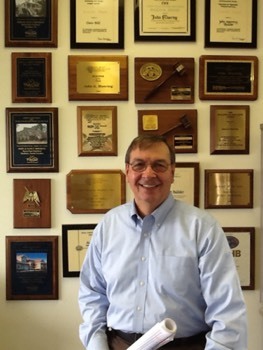 In 2008, John earned Third-party Verification Status for the insurance industry’s Fortified for Safer Living Program. Since that time, the company has built multiple green homes that have received the Gold Seal of the Fortified Home Program. With a custom home featuring Green Fortified Homes' Building Science and Fortified Standards, homeowners will quickly realize significant savings with greatly reduced utilities, insurance, and maintenance costs. The HVAC energy costs on a typical custom Green Fortified Home run no more than $1-1.50 per day. In Sunset Beach, John built a custom green home with average HVAC bill of only $35/month during the first 36 months. He also built a 3700ft² custom green home in Holden Beach where the average monthly HVAC costs was only $47.82. We selected John to build our passive/active solar home because of his prior experience with passive designs. He delivered everything that we asked for and was extremely flexible and helpful in making little changes during construction to improve on our initial designs. He is very attentive to the little details that make the difference between just OK and perfect. Not only was he easy to work with during construction, but after our home was completed John continued to follow up to make sure that everything worked as intended and to make any adjustments/repairs that were needed. He was especially helpful in working on our behalf with suppliers of components that were under warranty. We recommend John for his knowledge, workmanship and commitment to his client's best interests. When we moved here from Pennsylvania the one concern I had about the Coastal Carolina area were hurricanes. I researched "hurricane proof" construction and was sold on insulated concrete form (ICF). There was a picture I found in Mississippi after hurricane Katrina showing some poor town completely leveled... except for one lone house still standing, yes an ICF constructed home. Our designer Jack Scarborough put us in touch with John who was familiar with this type of construction and has built this type of home before and as they say, the rest is history. John suggested some changes to the design that we thought were beneficial and the final result speaks for itself. When everything was completed, we met the very strict design and construction regulations set forth by the Institute for Building and Home Safety (IBHS). We earned the GOLD award from IBHS and couldn't be happier. Thank you John. John Mooring built a new home for us, one that I designed and he brought to reality. His great depth of knowledge, experience, work ethic, patience and kindness were invaluable. I liked that he personally supervised the work and was on the site very often. As a professional engineer, I very much appreciated John's life long interest in building science, building envelopes, structural integrity, energy efficiency, and innovation. He's been into that stuff for decades now, not as a recent fad. To me, that puts him in a different class than your average builder. In matching Builders to my Clients' needs, I've found John Mooring to be very knowledgeable of the building industry, codes, etc. & highly experienced in a wide variety of home styles. He has a proven track record & his detailed approach to planning demonstrates his commitment in meeting - if not exceeding - their needs. His hands on philosophy ensures quality in construction & a finished product my Clients can be proud of. John Mooring is and excellent builder who listens, is honest and cares about his product. I designed my house and John drew up the plans for me to insure that it would be perfect, and it is. John also has been available to come back and help adjust things after the house was built. I love my house, it is safe, secure, economical and the flow is just right. In the future I plan to build another house and I will only do it if John is the builder. John Mooring is one of a handful of builders who truly understands how a building works, not just as a structure, but as a dynamic environment in which climate, ground, construction, and use by inhabitants all interact to demand performance. He is constantly educating himself on the latest in building science, and knows how to create the most resilient residences on the coast. John has my enthusiastic recommendation for your project. Thank you! John has received your message.